I will discuss the events of the Hungarian Grand Prix soon. 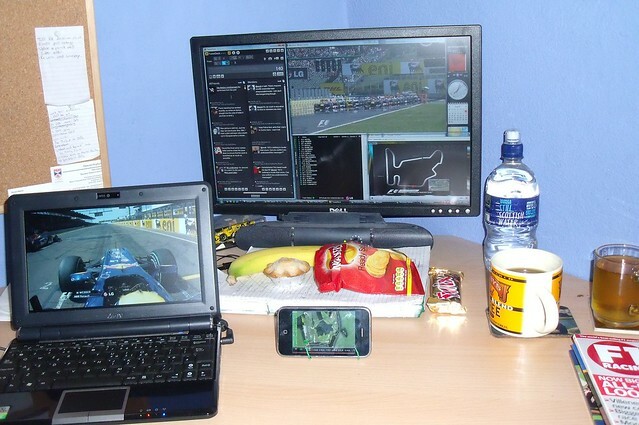 But today I decided to take a photograph of the way I watch F1. It has been a while since I have photographed it. The last time was probably early last year, soon after coverage switched to the BBC. With recent changes to the coverage, the desk has become even more congested. Click through to the Flickr page for annotations of what everything is. As you can see, I have two video screens. One is the BBC One television coverage, which usually carries the FOM world feed. On my netbook I have the onboard channel. I highly recommend having the onboard channel on a second screen. It is interesting to watch during any dull phases of the race. Often it’s useful to watch it in the corner of your eye — the onboard feed often catches incidents before the world feed does, and often covers parts of the race that are never seen on the world feed. I also have Twitter open. That has become increasingly hectic as I have followed more and more people. It is just impossible to keep on top of the comments, and I sometimes find that it distracts me from the race itself. Having said that, feel free to follow me — @vee8! At the bottom middle of the main monitor is the live timing from Formula1.com — a hugely useful companion to the race that I have used for many years now. I would feel absolutely lost watching a race without it. At the bottom right is the new driver tracker, which the BBC have begun to offer to viewers as a separate video feed. This is great for seeing where drivers are on the circuit, for visualising the gaps, seeing when traffic is coming up, and working out where drivers will feed back into the field after a pitstop. Then there is my iPhone. I used to use this for the Softpauer driver tracker app, although it is a bit redundant since the BBC have started offering FOM’s own version during the races! The app cost £20 at the beginning of the season. £20 down the pan perhaps. I might find another use for the iPhone — the Softpauer app has other views you can use, then there is Bernie’s own one, although this largely replicates the functionality of the live timing you get from Formula1.com. As you can see, I also stock up on food and drink to consume during the race. Due to the timings, I’m afraid to say I skip lunch altogether. So I eat lots of snacks during the race instead. Then there is stuff to drink. Usually I have coffee, but today I had tea. There is apple juice there too, and a backup stock of water should I need it. This is way beyond what I did when ITV covered the races. Back then you got 50 or so minutes of pre-race nonsense which was, let us be fair, nothing like as good as what the BBC bring us (despite the BBC apparently having a much lower budget). Post-race coverage was usually banal and brief. And I haven’t even mentioned all those advert breaks! I think the widely held view is that the BBC provide the best terrestrial television coverage for Formula 1 in the world, and I certainly agree that they do a largely excellent job. Certainly in the amount of airtime they give F1, they truly spoil us. There is typically 50 minutes of pre-race buildup. Then the race lasts around 90-100 minutes, or perhaps up to two hours. Then with the BBC One post-race show and the F1 Forum, the BBC typically bring us a staggering two hours of post-race reaction — that is longer than the race itself! As you can see from my desk, though, this brings its own dilemmas. When can I find time to eat my lunch? And when can I go for a personal pitstop? With about five hours of almost non-stop coverage, multiple video feeds, timing screens and internet commentary from all directions, watching grands prix today truly is a marathon event every other Sunday. Yes, such a world away! I think live timing was introduced in 2003? Straight away it was the main USP of Formula1.com — and in many ways it still is! It revolutionised the way I watch F1. I have the telly in the corner of the room with the BBC main feed, and my laptop with live timing and tweetdeck open together. And since yesterday the Softpauer Android app. Can’t get the driver tracker or video feed from the BBC site without messing with proxies, and I don’t really have the screen space to make it worth while.